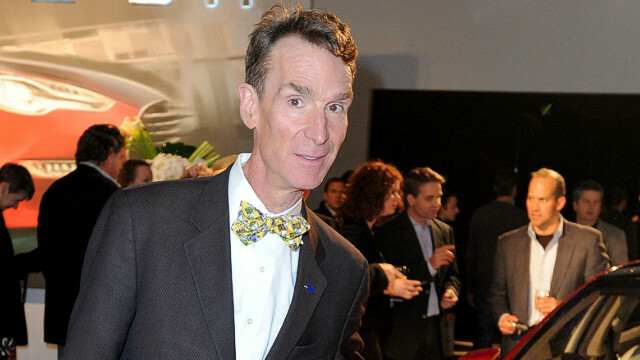 Bill Nye is still in it to win it. The "Dancing With the Stars" competitor suffered a partially torn ligament after taking a stumble in Monday night's routine, but he's recovering and is in hoping to get back on the dance floor. A source tells People magazine that the 57-year-old "Science Guy" is "in good spirits and is really hoping he can continue to compete." The injury happened after Nye stepped on the cuff of his pants. "We'll do R.I.C.E. – rest, ice, compression, elevation," he told People after his fall, "and see where we get." The injury was bad enough to require medical attention, but Nye remained optimistic as he waited for the doctor's orders with "Dancing" partner Tyne Stecklein. "We plan to dance!" Nye wrote. "Stand by..."
I'm looking forward to the spinoff of this show, Pooping with the Stars. Who's the creepy guy and why is he on my computer screen? That's your proctologist. Bend over and open wide. The science guy simply can't dance and will be eliminated soon. that meal hit the spot! ... who is this man? He should have been paired-up with Kate Gosselin. Clearly neither have danced a step in their lives. Michael Bolton too.